Hi my name is Rob Myers and I was writing to see if I could purchase or get on the waiting list for two hand raised budgies, when there ready.My girlfriend and I just moved in to a new house and we would like to welcome some new family members. I DASSEN A PETLOVER. I AM AN SPECIALIST IN HANDRAISED OF ALL SPECIES OF BABY BIRDS IN MAURITIUS. I have a question for you: where are you located?!!! I love your informational website! 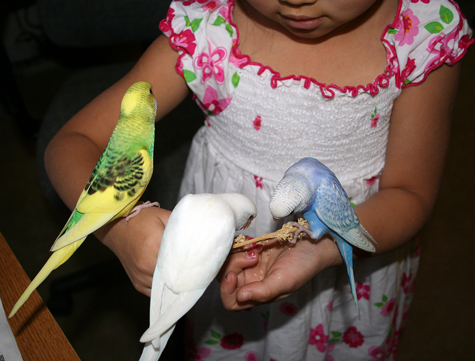 I have had two Budgies that were hand-raised and learned to talk. They lived relatively long lives. The last one we had was a rescue bird. She has been abused and was terrified of humans, or any kind of movement. She finally came to trust the family enough to come down to eat in front of us. She never let us touch her, until just before she passed away. We are hoping to get another young bird soon. Thank you. We are located in Fort Collins, Colorado. I love your family! I have 2 females and 1 male budgie and I’m hoping for a ready-to-breed male when one comes along 😉 Happy budgies! I have a large aviary with 7 budgies. I have just discovered one has a wing abnormality and flies very poorly. He crawls up the sides of the aviary to get around. The other birds torment him. I have left his cage inside the aviary with the door open. They stop him from coming out sometimes and go inside to intimidate him. Do I leave him in there as he is. Or should I bring him inside the house with us. I don’t want to do the wrong thing. I am very new at this. Any advice would be appreciated. Lindsay. he was very smart bird but it seems he was not born healthy do not buy a bird who twitches a lot in the cage. my female budgie is 13 years old and she grieved like you would not believe, Fritizie has no mate. I did get another bird his name is lucky hes very playful but does not like Fritzie the girl bird. I was able to tell Michiko he was loved and he did turn to hear my voice we had buried him and all so if you have questions on this I will answer your question.